Apple's iOS 12.2 started beta testing on Jan. 4, 2019, and became a stable release to download on any iOS device less than three months later on March 25, just after Apple's special event that introduced a slew of new services. The Apple News+ subscription is available now, while Apple TV Channels will appear in May; Apple Arcade and Apple TV+ this fall; and the Apple Card credit card partnered with Goldman Sachs and MasterCard this summer. While most of these services aren't available yet, everything else below you can use right away. There is also access to online newspapers such as The Wall Street Journal, Los Angeles Times, and Toronto Star, as well as "premium online publications" including theSkimm; The Highlight by Vox; New York Magazine's sites Vulture, The Cut, and Grub Street; and Extra Crunch from Verizon Media's TechCrunch. If you have an iPhone X, XS, XS Max, or XR, there are four new Animoji characters to use in Messages and FaceTime, bringing the total number of Animoji to 24, not including customizable Memoji. The new animated AR emoji characters include a giraffe, shark, boar, and owl. Whenever you view a city or town in Apple Maps in iOS 12.2, you can see the AQI for the area. The AQI, or air quality index, is a set of numbers and colors that describe how clean or polluted the air is. Apple added AQI data to the Weather app in iOS 12.0, but it's just now making it to Maps. Whenever you can see the current weather in the bottom right of a map, you'll be able to see the AQI value — from 0 to 500, least to most polluted — and its associated color right beneath it. However, it's opt-in, so you need to toggle the setting on before it will work. Check out our guide to see how and to see what all the values mean. Before the introduction of AQI values in Apple Maps, you were stuck with viewing the current weather for an area viewed on the screen. But since its addition, there's a new section in the Maps settings that lets you toggle off the bottom-right weather conditions icon. I've never found the weather information annoying or unuseful in Maps, but if you have, you now have the option to get rid of it. If you only care about the AQI conditions, you can keep that visible. There's a new AirPods setup screen that includes "Hey Siri," which is for the new second-generation AirPods releasing on March 26. If you want to use Siri hands-free on AirPods, you'll need the new ones, though you can still use Siri on the first-gens. New to Siri, in general, is the ability to ask your iPhone to play "any video, show, movie, sports game, or channel" on your Apple TV. An example given by Apple is to say, "Hey Siri, play Free Solo on my TV." Before, whenever you asked Siri to play something in the Music app, it'd do it, but all that would come up on the Siri screen would be a huge "Open Music" button. Now, you get the Now Playing widget so you can skip tracks right away if need be without opening Music or using the Control Center or Notifications Center widget. Playing music with Siri in iOS 12.1.4 (left) vs. iOS 12.2 (right). A tiny yet welcomed feature is a reorganized "About" screen in the "General" settings. Now, instead of just having your device's name by itself, it's joined by the software version, model name, model number, and serial number. All of those were available before in the big section of information, except the model name that shows "iPhone XS Max" or whatever type it is, which is completely new here. Storage information also has its own section now, and there's a new section for your "Limited Warranty" or "AppleCare+" if you have one. The "About" page (left) and after (right) the update. Before, you could only set Screen Time's "Downtime" feature for a specific amount of time for every day, but in iOS 12.2, you can choose specific days with specific times for each. You can even turn it off for some days and on for others. The "Downtime" settings in iOS 12.1.4 (left) vs. iOS 12.2 (right). Speaking of Screen Time, if you have "App Limits" set up for your device or a child's device, when you open the "App Limits" option, you'll see a new toggle up top. This lets you turn it on or off temporarily whenever needed. There's a new Safari setting called "Motion & Orientation Access" that's toggled off by default. Previously, web apps had access to accelerometer and gyroscope sensor data, but now it's opt-in because it could be used "data for tracking, analytics-gathering, and audience recognition," according to The Verge. This may prevent virtual reality and augmented reality content on websites from working correctly, though Apple's AR Quick Look feature seemed to be working properly without it. However, when visiting Apple's Experience iPhone website, it was clear that motion data was being blocked with the toggle off. When performing a web search in Safari, there are now blur arrows next to suggested searches that appear under the search bar. Tapping on an arrow will autofill that suggestion into the search bar, but it won't take you there automatically. You can still tap on the actual words next to the arrow to open that search up right away, but the arrow helps narrow your search down and get other recommendations. Safari would already warn you if a site's certificate is expired or illegitimate, and it would also notify you when a site was not secure during a login or checkout process. Now, Safari shames websites even more for not implementing HTTPS, an application protocol that encrypts data you send to and receive from a site. So whenever you land on a webpage that only uses HTTP, it will say "Not Secure" in the address bar. This also applies to the Safari browser when used inside apps. While the "Do Not Track" option was nothing more than a security blanket for Safari, it was still a way to hope that some websites and advertisers would acknowledge your request to not be tracked when browsing. Apple's finally admitting defeat, essentially saying that it never really mattered to begin with. Before, when you would use AutoFill for usernames and passwords in Safari, it would just fill in the info but you'd still have to tap "Log In" or "Enter" or whatever to actually sign in. Now, right after you AutoFill the credentials for a website account, it'll log you in right away. In older Music versions, you'd only see a carousel of highlights at the top of the "Browse" tab, but now the whole tab itself is jam-packed full of hot and trending albums, songs, artists, and playlists. "Browse" in iOS 12.1.4 (left) vs. iOS 12.2 (right). Apple updated its Wallet app's user interface a little bit in iOS 12.2. It definitely looks sleeker in some aspects, but it's really only visual changes. For instance, when you're viewing a card or pass, instead of seeing your additional cards and passes hidden at the bottom, they're entirely gone (this does not apply to the Wallet shortcut). So now you have to hit "Done" instead of just tapping another card, though, you can also still swipe down on the card to see all cards and passes. When viewing a credit or debit card by itself, any Apple Pay transactions will show up right underneath for a quick lookover. Also, the ellipsis (•••) button has also moved from the bottom to the top, which is where you access more details for the card or pass, and instead of square menu boxes, they're now rounded. Speaking of Wallet, your Apple Pay Cash card's look is also revamped. When accessing the card, you still see your last transaction, but you also see all transactions for the last year, in some cases. Additionally, Apple states that you can now transfer money to your bank account instantly using your Visa debit card. Before, it could take days. One of the more interesting additions is a color-based keyboard, a move that benefits developers more than anyone else. The keyboard color picker layout can only be accessed using an HTML5 color picker tool online right now, activated with the input type="color" element. Only simple colors appear in standard hexadecimal format, so RGB alpha colors, which appear in different opacities, won't work. It looks almost exactly like the color picker tool in the Notes app and the Markup tool in Photos, Mail, et. al., only it's its own keyboard, not a pop-up selector. You can test it out at W3Schools' HTML5 Color Picker or on Mozilla's tool. The color picker in Apple apps (left) vs. the new color keyboard (right). Apple announced at the beginning of the year that third-party TVs from manufacturers such as Sony, LG, and Vizio will be getting AirPlay 2 and HomeKit support. Samsung's TVs will also get AirPlay 2 functionality but is opting to include the iTunes Movies and TV Shows app instead of having HomeKit support. The update has shown signs of this support, where TV options show up in the Home app, such as a new "Allow Speaker & TV Access" to choose exactly who can view and send content to AirPlay 2 devices. Before, it just said "Allow Speaker Access." Hidden controls were also found for including TVs into home automation, such as dimming the lights when playing a movie. Siri is also apart of this, as you'll be able to tell Siri to open an app or play content on your TV, as mentioned above for Apple TV, as well as turn the TV off and on. Plus, you'll be able to AirPlay content from your iPhone to your TV just like you can on an Apple TV. 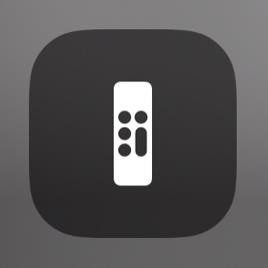 Now that the Apple TV isn't the only TV that can be controlled with your iPhone with AirPlay 2, and with the new Apple TV Channels subscription, it's time to update the Apple TV Remote, which will work with those other TV sets. So instead of the Apple TV image, the image is now a remote control. 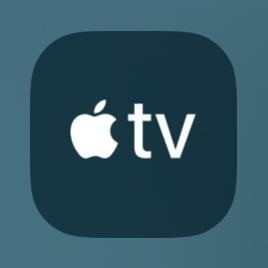 This icon appears in the Control Center for its control tile, as well as in other areas of iOS such as inside the video Now Playing screen in Siri, the lock screen, etc. The old icon in iOS 12.1.4 (left) vs. iOS 12.2 (right). 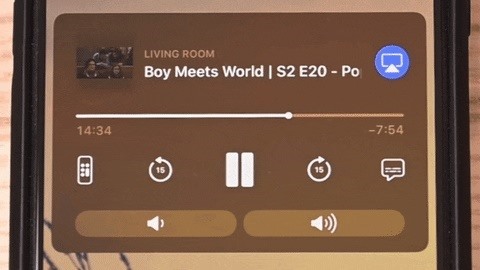 When using the Apple TV Remote in the Control Center, it would expand into a bigger card that let you access the menu, play/pause, use Siri, AirPlay content, rewind, fast-forward, and use the touchpad. Now, when you tap or long-press on the control, it expands full screen. The rewind and fast-forward buttons only appear when content is playing, and everything else is there plus a new "Search" button. The TV Remote in iOS 12.1.4 (left) vs. iOS 12.2 (right). The icon for "Screen Mirroring" has changed to more accurately visual what screen mirroring actually is. The former icon was very confusing, with just a triangle pointing up to a screen. The improved icon shows two displays. The Screen Mirroring control in iOS 12.1.4 (left) vs. iOS 12.2 (right). See that old Screen Mirroring icon up above? Welp, that's your new AirPlay icon now for videos. Previously, the AirPlay icon was a triangle tower with circular airwaves being emitted, and that's still the same case for audio being AirPlayed. For video streams, the triangle, which basically is a sideways play button, is pointing up toward the display (or device) your AirPlaying too. 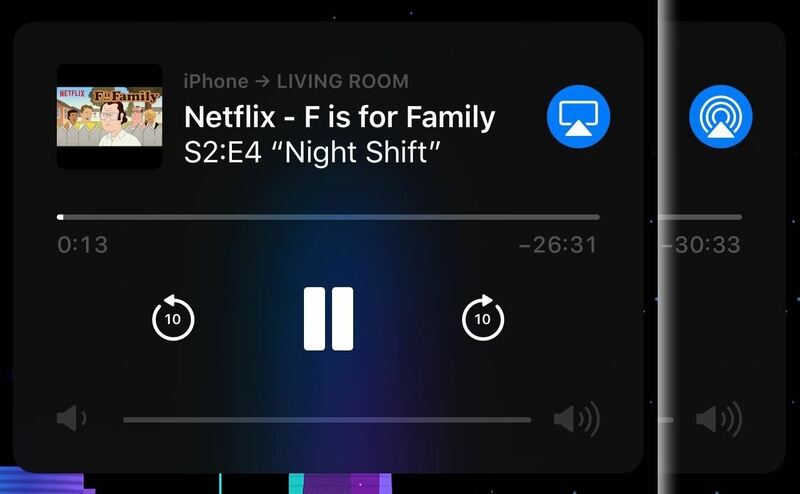 The UI on the lock screen's Now Playing widget is a little different for videos being AirPlayed. You get that new icon mentioned above, which you can tap to select and deselect AirPlay 2 speakers. You also get the Apple TV remote icon, captions button, and some volume up and down buttons instead of a slider control. If you have multiple AirPlay devices that work with your iPhone, the "destinations are now grouped by content type making it faster for you to find what device you want to play to," according to Apple. When you're AirPlaying video to a TV, you can now continue to use your iPhone to browse apps and play short audio and video files on your iPhone — without disrupting the AirPlay stream. If you're in the northern section of North America, you won't have to miss out on Apple's news platform anymore since iOS 12.2 includes News support for Canada. At first, the number of sources available in the Apple News app will be limited, but it will continue to grow for Canadians as time goes on. But you can view news sources in either English or French, a nice addition. Also, Canadians can also subscribe to Apple News+ for $12.99 a month. Also new to News are small visual changes. 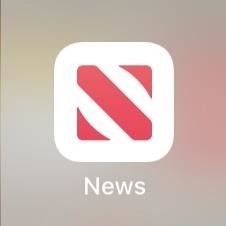 First, the "Apple" in "Apple News" up top by the date is replaced by the Apple icon, similar to how it is for Apple Pay. Also, the News logo and current temperature have been removed from the top right. Why did Apple remove those? Who knows. I don't see why the temperature had to go (except that it was buggy on occasion), but the News icon wasn't necessary. "Digest" is also replaced by the new "News+" tab. The "Today" view in iOS 12.1.4 (left) vs. iOS 12.2 (right). 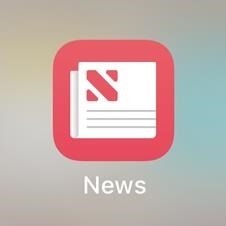 The new home screen app icon for News is different. While the "N" part looks almost the same, only with some more curves, it now is the focus of the icon. Basically, it's like the zoomed in to the "N" in the old icon and cropped everything else out, leaving only a white border and adding some curves to the inside portion of the letter. If you live near an Apple Store that has "Today at Apple" mini classes, you might be able to get recommendations from Siri about upcoming events. In the "Siri & Search" settings for the Apple Store app, there's a new toggle for "Find Interests in Other Apps." By default, this is toggled on, so it's opt out, but with it on, it states that "Siri can suggest Today at Apple sessions based on your Safari and app usage." If you have AT&T as your carrier, you might see a new "5G E" symbol instead of the normal "LTE" in the status bar. The new symbol stands for "5G Evolution," which is not to be confused with "5G" at all. Currently, there are no iPhone models that can support 5G speeds, so for those that see it on an iPhone 8, 8 Plus, X, XS, XS Max, or XR, it just means you've got Advanced 4G LTE speeds, a small step up from regular 4G. Addresses an issue in Settings –> General –> iPhone Storage where the storage size of some large apps, the System category, and the Other category in the storage bar graph could be incorrect. We'll continue to dive into the new iOS 12.2 update to find more interesting features for iPhone. We've already spotted some smaller, behind-the-scenes features here and there, and we'll add them above once we've learned everything we can about them.